About 19 inches long. Black upper parts with a white fan shaped patch centered on a flat disk-like crest. Brownish tinge on the wings and tail. White underside with chestnut flanks. 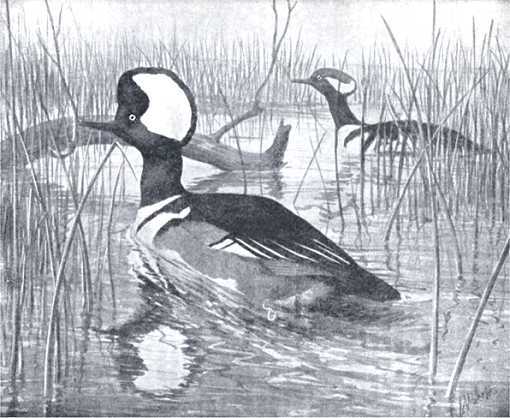 Hooded mergansers inhabit woodlands bordering rivers and ponds throughout most of eastern U.S., and Canada in the Hudson Bay region and as far west as British Columbia. They nest from about 45 degrees latitude north to the Arctic Circle. Common throughout the lower Mississippi River Valley in winter and some migrate as far as Mexico and the Caribbean. They dive for small fish, insects, roots and seeds in wetlands, ponds and lakes often rich with aquatic vegetation and fallen timber. For a nest, they line a tree or stump cavity with grass, leaves and down. Females lay five to eighteen ivory white eggs which hatch after about one month of incubation. The day after the ducklings hatch, the female parent coaxes them out of the nest to water, teaches them to swim, dive, gather food and defends them until they are ready to fly at about two months age. The Hooded Merganser Nest Box (same as for Wood Duck and Kestrel) has a 10″ by 10″ floor, 24″ inside floor to ceiling, 4″ wide by 3″ high entrance hole located 21″ above the floor and ventilation openings in the floor and under the roof. 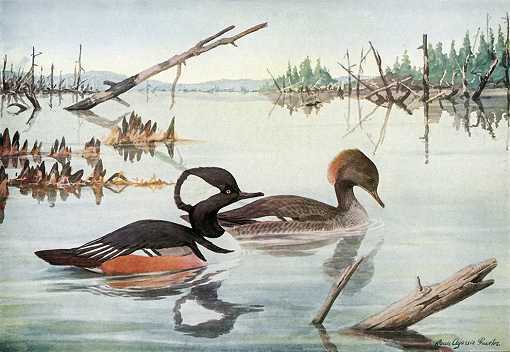 Hooded mergansers inhabit woodlands bordering rivers and ponds throughout most of eastern U.S., and Canada in the Hudson Bay region and as far west as British Columbia. They nest from about 45 degrees latitude north to the Arctic Circle. Common throughout the lower Mississippi River Valley in winter and some migrate as far as Mexico and the Caribbean. A hinged roof can be secured with shutter hooks or a Side Opening Door may be a more convenient alternative.